Huawei approached Smart Codes a full service digital in Tanzania when they wanted to introduce a new mobile model in Tanzanian Market. Huawei is a global leader of ICT solutions. Our client’s smart devices are used in 170 countries and regions and was ranked 285th in 2013 Global Fortune 500 companies. Huawei model Y520 device which was being introduced targeted young individuals. Smart Codes were challenged to prepare and execute digital campaign. After a thorough digital research Smart Codes came up with a tagline Huawei Kishkwambi which was extremely catchy and trending especially to the intended audience. Smart Codes subdivided the campaign in three phases; the pre-launch, launch and post launch. Smart Codes run a teaser which was random posts by our influencers that had no particular details with #Kishkwambi. The curiosity of the target audience created a large traffic because the tagline was a popular word in streets which had no particular identity. Therefore, a few followers that our clients had on different platform spread out the word by questioning what it was to the point that whenever you mention the tagline even in the local radio station they would associate it with the campaign. The teaser also included viral videos and posts that show devices’ features implicitly. Smart Codes also created a special website page with Google Analytics to track how many visitors the page has had and where they were. After the launch this web page had all the information about the device and how and where to buy them and price. At this stage Smart Codes prepared Press Release and distributed to all major blogs in Tanzania. Furthermore, we created a review (unboxing) by the major tech blogger in Tanzania. The unboxing was done before and the review video was shared on all media outlets. On the other hand, the sponsored article review was posted on major tech blogs in Tanzania which assured that everyone who read a blog that day which was written in Tanzania knew about the digital campaign that Smart Codes was executing. 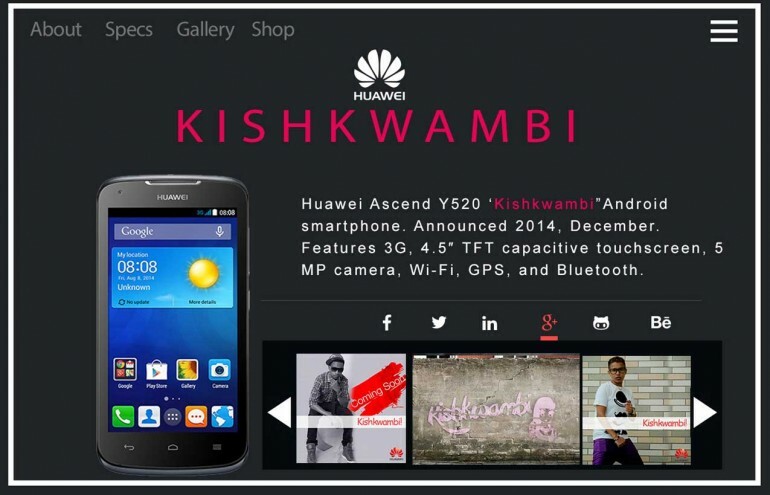 The launching also unveiled the competition of which 50pcs of Huawei Ascend Y520 Kishkwambi were given to active followers whom we called Smart-Marketias. These winners were the ones who did what Smart Codes call word of fingers marketing. Furthermore, Smart Codes aimed at creating the longest video possible which would break the world Guinness World Record of people saying the word Kishkwambi. This video will be a collection of short clips from the fans who have posted in the social media with #Kishkwambi and from the dedicated WhatsApp number. All posts in this phase were focused on sells. Furthermore, winners were announced in this stage and successful stories from users were published by Smart Codes. In this phase Smart Codes assisted in pushing online sales. Facebook likes before the campaign were 203,260 on our client’s page but 30 days after the campaign we had 225,000. Twitter followers on our client’s page before the campaign were 2,400 but 30 days after the campaign we had 3,100. Instagram followers on our client’s page before the campaign were 6,500 but 30 days after the campaign we had 32,000. Dedicated website visitors went from 0 to 268,000 after 30 days of the campaign. 50 phones were given to the winners. The most impressive smart-marketias from Instagram had more than 1010 likes on his Huawei kishkwambi post while another one had 536 likes on facebook kishkwambi post. Smart Codes feels proud of the success and we look forward to the next challenge.